Tawas, with its miles of gentle beach on a peninsula curving out into Lake Huron, was an ideal setting for Wayfarer Worlds IV and for those who like to "get away from it all". Take Geoff Hodshon for instance: He was not fazed at all when his airline lost all his clothes. Before you knew it, there was Geoff strolling around Tawas looking like a real duck hunter - except for his sandals. The weather was typical of a Michigan summer: hot with a few violent thunderstorms resulting from the heat, plus a good cross-section to test all our sailing skills. Perhaps the most challenging moments came in race 3 where the winds off the shore were very shifty before they finally gave up the battle with the lake breeze that brought a 180° shift at the start of the run. Toronto’s Chris Kofler and his wife, Carolyn, (see photos below) lulled everyone to sleep as they started the series with a nondescript 6-10-12 but then got everything going beautifully and became the first non-UK World Champions. While the Koflers kept BUMBLE BEE moving in all conditions, other contenders either ran into foul trouble or looked too weak in some conditions. American sailmaker, Skip Remter, for example was fast only in the windy stuff while the reverse was true of Uncle Al who dominated in the light to medium stuff only to fall to 11th and 15th in the heavier going. Alan Neville and Geoff Hodshon both suffered for good sportsmanship: Alan retired (no 720 in those days!) after admitting to a very marginal pre-start foul that most would have argued or denied. But the worst hit was Geoff who appeared to have clinched the World title with wins in races 5 and 6. Geoff very kindly agreed to give your Uncle Al room at the leeward mark when the latter came surfing in on a two-metre wave at the last second. Shortly thereafter, Al and Geoff were two of four boats that collided during the rounding. Geoff went on to beautifully win that race only to have the rookie Protest Committee inexplicably absolve the boat on the extreme outside. Only Geoff did not complain as the rest of us cursed the Committee or shook our heads in disbelief! Nonetheless, it was a fine, enjoyable week with great, friendly competition and a wild finish as any one of about eight crews still had a chance at the title going into the final race. With everyone living more or less on site, these Worlds brought the best fellowship yet among the competitors. And not a word of complaint from the Brits or the Danes about borrowed boats that were undoubtedly far below the standard they were used to – they simply went out and made a very good best of it! 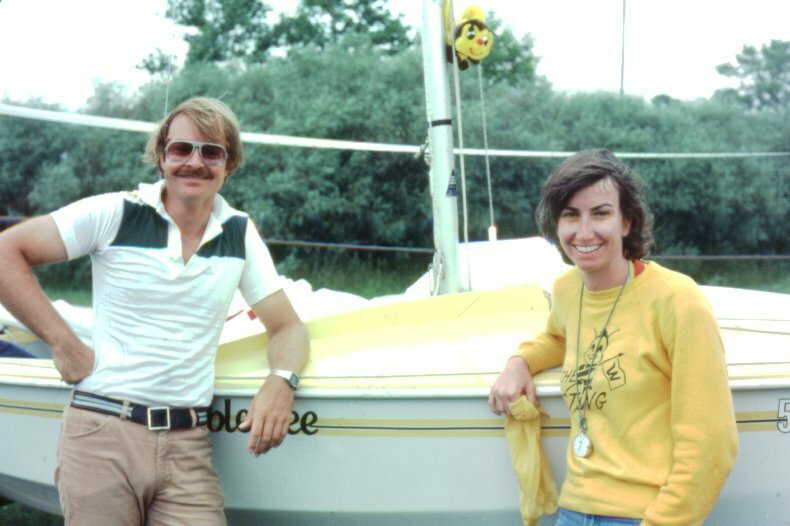 Of note: A young crew named Peter Rahn sailed his first Worlds here with French-Canadian, André Laframboise. 15 years later, Peter would re-appear in Wayfarers with his 9-year-old son, Alex, as the youngest Worlds crew ever! Peter is now the Chairman of the Canadian Wayfarer Association. 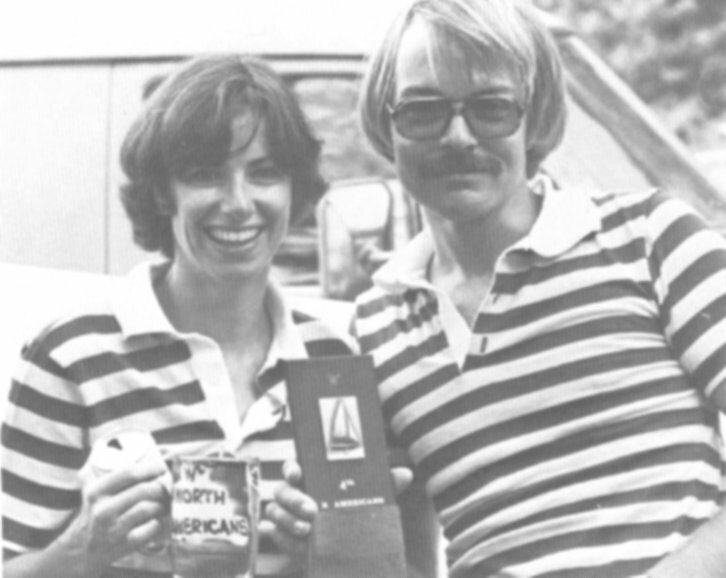 It is also interesting to note that the majority of sailors who appear on the facing page continue to sail Wayfarers, including Farum’s Joel Bøgh and Jørgen Vekslund and Calgary’s Derwyn and Nancy Hughes who have now driven the 8000 km round-trip to the Worlds three times!! !